Loeffler endocarditis and endomyocardial fibrosis are restrictive cardiomyopathies, defined as diseases of the heart muscle that result in impaired ventricular filling with normal or decreased diastolic volume of either or both ventricles. Systolic function and wall thickness may remain normal, especially early in the disease, as reported by Richardson and associates. [1, 2] Both conditions are associated with eosinophilia. The associations among eosinophilia, active carditis, and multiorgan involvement were first described by Loeffler in 1936. Pathologic specimens in Loeffler endocarditis show eosinophilic myocarditis, a tendency toward endomyocardial fibrosis and clinical manifestations of thromboembolism, and acute heart failure. Eosinophilic states that may occur in association with Loeffler endocarditis include hypereosinophilic syndrome, eosinophilic leukemia, carcinoma, lymphoma, drug reactions or parasites, as reported in multiple case series. Pathophysiologically, the fibrotic stage of Loeffler endocarditis is very similar to the disease entity described as endomyocardial fibrosis, which is indolent in comparison to Loeffler endocarditis. The tropical form of endomyocardial fibrosis is associated with eosinophilia, a common finding in Loeffler endocarditis. Endomyocardial damage in Loeffler endocarditis is well known and described in a study by Solley and associates. Myocardial involvement is less well known and has been considered a manifestation of an acute necrotic stage of eosinophilic endomyocardial disease, as reported by Olsen and colleagues. More recently, cases of isolated eosinophilic myocarditis have been reported without signs of endomyocardial involvement, with or without vasculitis. The gene defect is localized to an interstitial chromosomal deletion on chromosome band 4q12, resulting in fusion of the Fip1-like1 (FIP1L1) gene to the platelet-derived growth factor gene alpha (PDGFRA). The protein product of this gene is a tyrosine kinase enzyme that transforms the hematopoietic stem cells. This FIP1L1-PDGFRA fusion gene defect was identified in 9 of 16 patients treated with imatinib. This study also highlights the importance of reclassifying HES as a myeloproliferative disorder of a possible single clone based on genotyping, as the FIP1L1-PDGFRA gene rearrangement is a clonal abnormality. The following list summarizes the initial clinical presentations of eosinophilic endomyocardial disease in relation to the predominant pathologic stage of the disease as reported by Alderman et al in the Textbook of Cardiovascular Medicine. Death is usually related to multiorgan dysfunction in the presence of congestive heart failure. The image shows dense fibrosis of ventricle in a postmortem dissected heart. Myocardial as well as valvular involvement with Loffler endocarditis. This image shows dense fibrosis of ventricle in a postmortem dissected heart. The condition is rare and is seen mostly in immigrants from Africa, Asia, and South America. Loeffler endocarditis is primarily confined to the rain forest (tropical and temperate) belts of Africa, Asia, and South America. The literature reports a 35-50% 2-year mortality rate in patients with advanced myocardial fibrosis. Substantially better survival rates may be seen in less symptomatic patients who have milder forms of the disease. As noted, this rate may reflect underdiagnosis of clinically inapparent disease, as for other types of cardiomyopathy. The overall prognosis of patients with Loeffler endocarditis is poor and depends on the location of involvement in the heart. The disease is usually slow in onset, with progression to increasing degrees of right and left heart failure. The condition has a predilection for African and African American populations, notably the Rwanda tribe in Uganda, and for people of low socioeconomic status. Whether this is due to genetic factors or the epidemiology of underlying environmental factors is not known. 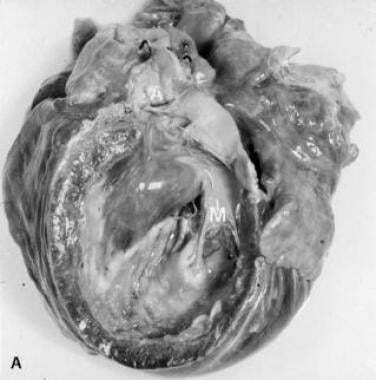 Loeffler endocarditis has a predilection for males. However, endomyocardial fibrosis, which has similar clinical manifestations, is found equally frequently in both sexes. The reported age range is 4-70 years. Loeffler endocarditis particularly affects young males, as does its close counterpart, endomyocardial fibrosis, which is more common in children and young adults. Richardson P, McKenna W, Bristow M, et al. Report of the 1995 World Health Organization/International Society and Federation of Cardiology Task Force on the Definition and Classification of cardiomyopathies. Circulation. 1996 Mar 1. 93(5):841-2. [Medline]. Gotlib J. World Health Organization-defined eosinophilic disorders: 2011 update on diagnosis, risk stratification, and management. Am J Hematol. 2011 Aug. 86(8):677-88. [Medline]. Loeffler W. Endocarditis parietalis fibroplastica mit Blut-eosinophilie, ein eigenartiges Krankheitshild. Schweiz Med Wochenschr;. 1936. 66:817-820. Oakley CM, Olsen GJ. Eosinophilia and heart disease. Br Heart J. 1977 Mar. 39(3):233-7. [Medline]. Herzog CA, Snover DC, Staley NA. Acute necrotising eosinophilic myocarditis. Br Heart J. 1984 Sep. 52(3):343-8. [Medline]. Tonnesen P, Teglbjaerg CS. An "unexpected" fatal case of the hypereosinophilic syndrome. Eur J Respir Dis. 1984 Jul. 65(5):389-93. [Medline]. Kim CH, Vlietstra RE, Edwards WD, et al. Steroid-responsive eosinophilic myocarditis: diagnosis by endomyocardial biopsy. Am J Cardiol. 1984 May 15. 53(10):1472-3. [Medline]. Isaka N, Araki S, Shibata M, et al. Reversal of coronary artery occlusions in allergic granulomatosis and angiitis (Churg-Strauss syndrome). Am Heart J. 1994 Sep. 128(3):609-13. [Medline]. Seshadri S, Narula J, Chopra P. Asymptomatic eosinophilic myocarditis: 2 + 2 = 4 or 5!. Int J Cardiol. 1991 Jun. 31(3):348-9. [Medline]. Solley GO, Maldonado JE, Gleich GJ, et al. Endomyocardiopathy with eosinophilia. Mayo Clin Proc. 1976 Nov. 51(11):697-708. [Medline]. Olsen EG, Spry CJ. Relation between eosinophilia and endomyocardial disease. Prog Cardiovasc Dis. 1985 Jan-Feb. 27(4):241-54. [Medline]. Priglinger U, Drach J, Ullrich R, et al. Idiopathic eosinophilic endomyocarditis in the absence of peripheral eosinophilia. Leuk Lymphoma. 2002 Jan. 43(1):215-8. [Medline]. Tai PC, Ackerman SJ, Spry CJ, et al. Deposits of eosinophil granule proteins in cardiac tissues of patients with eosinophilic endomyocardial disease. Lancet. 1987 Mar 21. 1(8534):643-7. [Medline]. Spry CJ, Tai PC, Davies J. The cardiotoxicity of eosinophils. Postgrad Med J. 1983 Mar. 59(689):147-53. [Medline]. Gleich GJ, Frigas E, Loegering DA, et al. Cytotoxic properties of the eosinophil major basic protein. J Immunol. 1979 Dec. 123(6):2925-7. [Medline]. Slungaard A, Vercellotti GM, Tran T, et al. Eosinophil cationic granule proteins impair thrombomodulin function. A potential mechanism for thromboembolism in hypereosinophilic heart disease. J Clin Invest. 1993 Apr. 91(4):1721-30. [Medline]. Cunningham K, Davies RA, Catching J, Veinot JP. Pathologic quiz case: a young woman with eosinophilia and heart failure. Primary hypereosinophilic syndrome with loeffler endocarditis. Arch Pathol Lab Med. 2005 Jan. 129(1):e29-30. [Medline]. Cools J, DeAngelo DJ, Gotlib J, et al. A tyrosine kinase created by fusion of the PDGFRA and FIP1L1 genes as a therapeutic target of imatinib in idiopathic hypereosinophilic syndrome. N Engl J Med. 2003 Mar 27. 348(13):1201-14. [Medline]. Vandenberghe P, Wlodarska I, Michaux L, et al. Clinical and molecular features of FIP1L1-PDFGRA (+) chronic eosinophilic leukemias. Leukemia. 2004 Apr. 18(4):734-42. [Medline]. Rotoli B, Catalano L, Galderisi M, et al. Rapid reversion of Loeffler's endocarditis by imatinib in early stage clonal hypereosinophilic syndrome. Leuk Lymphoma. 2004 Dec. 45(12):2503-7. [Medline]. Alderman EL. Non-infective endocardial disease. Cardiovascular Disease. 1999. 1-7. Bestetti RB, Corbucci HA, Fornitano LD, et al. Angina-like chest pain and syncope as the clinical presentation of left ventricular endomyocardial fibrosis: a case report. Angiology. 2005 May-Jun. 56(3):339-42. [Medline]. Coelho-Filho OR, Mongeon FP, Mitchell RN, Blankstein R, Jerosch-Herold M, Kwong RY. Images in cardiovascular medicine. Loeffler endocarditis presenting with recurrent polymorphic ventricular tachycardia diagnosed by cardiac magnetic resonance imaging. Circulation. 2010 Jul 6. 122(1):96-9. [Medline]. Weller PF, Bubley GJ. The idiopathic hypereosinophilic syndrome. Blood. 1994 May 15. 83(10):2759-79. [Medline]. Maruyoshi H, Nakatani S, Yasumura Y, et al. Loffler's endocarditis associated with unusual ECG change mimicking posterior myocardial infarction. Heart Vessels. 2003 Mar. 18(1):43-6. [Medline]. Mor A, Segev A, Hershkovits R, et al. Hypereosinophilic syndrome presenting as acute myocardial infarction. Allergy. 2000 Sep. 55(9):899-900. [Medline]. Gudmundsson GS, Ohr J, Leya F, et al. An unusual case of recurrent Loffler endomyocarditis of the aortic valve. Arch Pathol Lab Med. 2003 May. 127(5):606-9. [Medline]. Niemeijer ND, van Daele PL, Caliskan K, Oei FB, Loosveld OJ, van der Meer NJ. Loffler endocarditis: a rare cause of acute cardiac failure. J Cardiothorac Surg. 2012 Oct 10. 7:109. [Medline]. [Full Text]. Klag T, Schnetzke U, Benz R, et al. Leriche's syndrome and Loffler endocarditis in a 30-year-old patient presenting with hypereosinophilic syndrome. Ann Hematol. 2012 Jan. 91(1):139-41. [Medline]. Simonnet B, Jacquier A, Salaun E, Hubert S, Habib G. Cardiac involvement in hypereosinophilic syndrome: role of multimodality imaging. Eur Heart J Cardiovasc Imaging. 2014 Oct 9. [Medline]. Parrillo JE. Heart disease and the eosinophil. N Engl J Med. 1990 Nov 29. 323(22):1560-1. [Medline]. Del Bene MR, Cappelli F, Rega L, Venditti F, Barletta G. Characterization of Loeffler Eosinophilic Myocarditis by Means of Real Time Three-Dimensional Contrast-Enhanced Echocardiography. Echocardiography. 2011 Nov 8. [Medline]. Spyrou N, Foale R. Restrictive cardiomyopathies. Curr Opin Cardiol. 1994 May. 9(3):344-8. [Medline]. Child JS, Perloff JK. The restrictive cardiomyopathies. Cardiol Clin. 1988 May. 6(2):289-316. [Medline]. Watanabe K, Tournilhac O, Camilleri LF. Recurrent thrombosis of prosthetic mitral valve in idiopathic hypereosinophilic syndrome. J Heart Valve Dis. 2002 May. 11(3):447-9. [Medline]. Zakhama L, Slama I, Boussabah E, Harbegue B, Mimouni M, Abdelaali N, et al. Recurrent native and prosthetic mitral valve thrombosis in idiopathic hypereosinophilic syndrome. J Heart Valve Dis. 2014 Mar. 23(2):168-70. [Medline]. Paydar A, Ordovas KG, Reddy GP. Magnetic resonance imaging for endomyocardial fibrosis. Pediatr Cardiol. 2008 Sep. 29(5):1004-5. [Medline]. Langwieser N, von Olshausen G, Rischpler C, Ibrahim T. Confirmation of diagnosis and graduation of inflammatory activity of Loeffler endocarditis by hybrid positron emission tomography/magnetic resonance imaging. Eur Heart J. 2014 Sep 21. 35(36):2496. [Medline]. Arnold M, McGuire L, Lee JC. Loeffler's fibroplastic endocarditis. Pathology. 1988 Jan. 20(1):79-82. [Medline]. Fawzy ME, Ziady G, Halim M, et al. Endomyocardial fibrosis: report of eight cases. J Am Coll Cardiol. 1985 Apr. 5(4):983-8. [Medline]. Felice PV, Sawicki J, Anto J. Endomyocardial disease and eosinophilia. Angiology. 1993 Nov. 44(11):869-74. [Medline]. Uetsuka Y, Kasahara S, Tanaka N, et al. Hemodynamic and scintigraphic improvement after steroid therapy in a case with acute eosinophilic heart disease. Heart Vessels Suppl. 1990. 5:8-12. [Medline]. Butterfield JH, Gleich GJ. Interferon-alpha treatment of six patients with the idiopathic hypereosinophilic syndrome. Ann Intern Med. 1994 Nov 1. 121(9):648-53. [Medline]. Tanaka H, Kawai H, Tatsumi K, Kataoka T, Onishi T, Yokoyama M, et al. Surgical treatment for Loffler's Endocarditis with left ventricular thrombus and severe mitral regurgitation: a case report. J Cardiol. April, 2006. 47 (4):207-13. [Medline]. Jategaonkar S, Butz T, Faber L. [Surgical treatment of the hypereosinophilic syndrome with cardiac involvement (Loffler's endocarditis)]. Dtsch Med Wochenschr. Mar. 2007. 7133(12):50-52. [Medline]. Abonia JP, Putnam PE. Mepolizumab in eosinophilic disorders. Expert Rev Clin Immunol. 2011 Jul. 7(4):411-7. [Medline]. [Full Text]. Disclosure: Received honoraria from Medtronic, for speaking and teaching; Received honoraria from Zoll for speaking and teaching; Received honoraria from Boeringer Ingelheim for speaking and teaching; Received honoraria from St Jude''''''''s Medical for speaking and teaching; Received honoraria from Boston Scientific corporation for speaking and teaching; Received honoraria from Biotronik for speaking and teaching; Received honoraria from Sanofi Aventis for speaking and teaching.